One of this month’s Tuesdays with Dorie assignments is making Hot Chocolate Panna Cotta from Baking Chez Moi by Dorie Greenspan. This was given the name “Hot Chocolate Panna Cotta” because it reminded Dorie of a hot chocolate she had from a Parisian cafe. I thought I knew what this meant after reading her description of the recipe, but after tasting this, I really understood why this recipe was given its name. This reminded me of a hybrid of hot chocolate, chocolate pudding, and Jell-o (three things I love). This recipe comes together quickly and it doesn’t require a lot of ingredients; all it takes is some milk, cream, gelatin, cocoa powder, granulated sugar, sea salt, and good chocolate. There aren’t many steps, either. The process involves bringing the milk, cream, cocoa powder, sugar, and salt up to a simmer, then adding in bloomed gelatin, and then pouring them over melted chocolate. I didn’t take any process photos for this recipe because it was mostly just boiling and straining the ingredients (nothing very interesting to see). This recipe is very simple and the results are truly delicious; this really does taste like [cold] hot chocolate! The most difficult part was unmolding the Hot Chocolate Panna Cotta. I went around the inside edges of the ramekins with a warm knife, but I had to give them a few whacks before they slid out. Fresh raspberries and blueberries go great with this Hot Chocolate Panna Cotta. They bring a little bit of brightness to the creaminess of the panna cotta. Blueberries go especially well with this panna cotta! Thanks for another great recipe, Dorie! This will be a recipe I’ll be visiting again in the future! Hot Chocolate Panna Cotta recipe is on page 373 of Baking Chez Moi by Dorie Greenspan. Yum! Your description makes me look forward to making this. This is so pretty! I am not a fan of chocolate pudding or Jello (jelly) so I wonder if I’ll like it as much?! Brightness of the berries paired with creaminess of the chocolate pudding is a fantastic combination. Great pictures. I look forward to making it. So brave of you to unmold them! They look so elegant with the fruit garnish. Beautiful with berries. I wish I had your talent for photography. Beautiful photos, the berries are nice. I agree they did taste like chocolate pudding and the kids loved it. 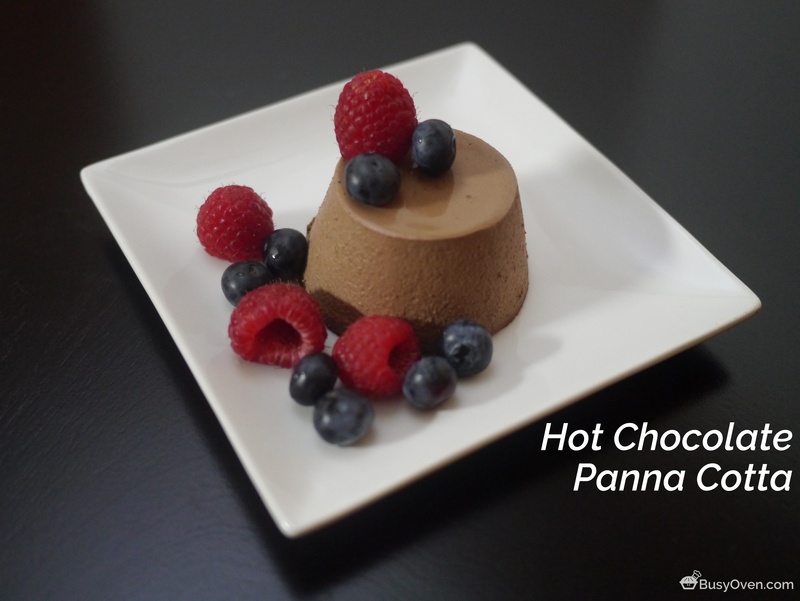 What a fantastic idea to serve them with berries and your Panna cotta looks about perfect! Could have come from a restaurant– beautifully plated! Great presentation! I did wonder how it would taste like hot chocolate, as I haven’t made the recipe yet, but reading your description makes me very enthusiastic to try! Love it! I can’t wait to try these! They look perfect. Gorgeous presentation! They look beautiful, unmolded. I finally caught up on this one and the carrot-tangerine cake. I’ll be revisiting this panna cotta in the summer, for sure.